Rapid rolling cross-country performance. 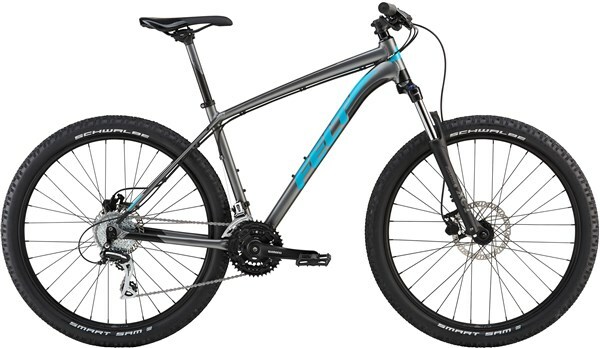 The Felt Dispatch7/80 27.5” is a great value hardtail mountain bike that is ideal for cross-country adventures and won’t be shy on trail centre loops. It’s alloy frame is lightweight and the Suntour soften bumps along the trail. The Shimano drivetrain shifts smoothly, giving you reliable riding. The Dispatch 7/80 is the ideal choice for both the experienced mountain biker and a rider looking to get outside and enjoy their local trails. Its frame is made from Felt’s F-Lite hydroformed aluminium for a rugged build and a smooth ride. Its 27.5-inch wheels are tubeless-ready, and its SR/Suntour fork with 100mm of travel will take the edge off the rider over the roughest terrain. Ergonomic grips and saddle provide a comfortable ride to keep you pedalling from sunrise to sunset. Front Tyre: Schwalbe Smart Sam K-guard, 27.5 x 2.25"
Rear Tyre: Schwalbe Smart Sam K-guard, 27.5 x 2.25"